Building Biltmore was, at the time, one of the largest undertakings in the history of American residential architecture and the results were astounding. Over a six-year period, an entire community of craftsmen worked to build the country's premier home. The estate boasted its own brick factory, woodworking shop, and a three-mile railway spur for transporting materials to the site. The celebrated architect Richard Morris Hunt modeled the house on three châteaux built in 16th-century France. It would feature 4 acres of floor space, 250 rooms, 34 bedrooms, 43 bathrooms, and 65 fireplaces. The basement alone would house a swimming pool, gymnasium and changing rooms, bowling alley, servants' quarters, kitchens, and more. The grounds of the 125,000-acre estate were designed by Frederick Law Olmsted, the creator of New York's Central Park and the father of American landscape architecture. He not only developed acres of gardens and parkland, but in his efforts to protect the environment and reclaim over-farmed land, Olmsted established America's first managed forest. George Vanderbilt officially opened the home to friends and family on Christmas Eve in 1895. He had created a country retreat where he could pursue his passion for art, literature, and horticulture. After marrying the American Edith Stuyvesant Dresser (1873–1958) in Paris during the summer of 1898, George and his new bride came to live at the estate. 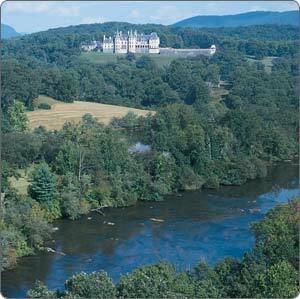 Their only child, Cornelia (1900–1976), was born and grew up at Biltmore.